Do you remember that corrupt scumbag Dennis Sammut? You’ll never believe this. Talk about fleeing a mess of corruption, violence, unpaid bills and defaults on your ginormous bank loan (from the bank that you ran), and fetching up elsewhere to leave your corrupt and shady past behind and reinvent yourself as an academic and pillar of international relations society. I speak of Dennis Sammut, a name that will mean nothing to anybody younger than 50 but a great deal to anybody who had to survive the trauma of life in Malta during the worst excesses of Karmenu Mifsud Bonnici’s Labour government. Dennis Sammut was the Labour Party’s administrative secretary when Dom Mintoff was the party leader. He was also a Labour electoral candidate who was made executive chairman of the Bank of Valletta in January 1982, a position he held until the Nationalist Party was elected to government in May 1987. While he was in charge of the bank, he gave himself a rather large personal loan – I seem to recall it was in the region of Lm50,000, which in those years could buy you four houses on Sliema’s Tower Road (yes, really) – and threw all kinds of wild parties with what another generation would have called “unsavoury characters”. He moved around with a gang of thugs and, one night in the winter of 1984/1985, burst into Saddles bar in Spinola Bay, St Julian’s, with all those thugs in tow. He stood and watched as they harassed the girls (I believe he was and no doubt still is gay, but of the Ronnie Pellegrini variety though unmarried and childless), as they bullied the barmen into giving them free drinks, pushed people around and threatened to break the place up. Some people ran across to the police station opposite to get help, but having twigged that it was Dennis Sammut, the police waited until he and his gang had left before they turned up to check out what was happening at the bar. Bear in mind that Sammut was executive director of the Bank of Valletta when this happened. Imagine, say, Charles Borg – who was the bank’s CEO until a few months ago – doing something similar. Well, those were the glory days of the #corrupthamalli who are now back in power thanks to a lot of #bloodyidiots. One of the barmen – there were two at Saddles back then, Mark and Silvio – was Silvio Debono, now reinvented as Dr Silvio de Bono, president of the board of governors at the Malta College for the Arts, Science and Technology (MCAST), so of course he will probably pretend that he doesn’t remember. Because you know how it is, there were bust-ups by gangs of Labour thugs led by the executive director of the Bank of Valletta every night of the week among the very tal-pepe Saddles crowd back in the mid-1980s. But the reason I know it all happened is because I was there that night, as I was most nights. 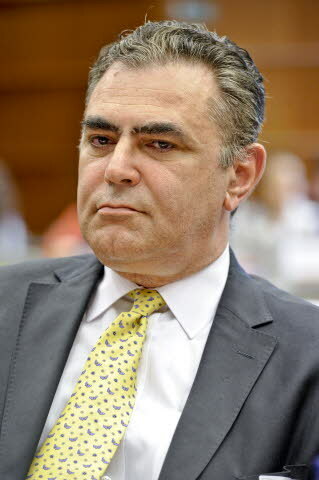 When Labour was thrown out of office in 1987, Dennis Sammut latched himself onto Muammar Gaddafi’s teat and worked full-time for the Gaddafi-funded POPEM (Organisation for peace among the peoples of Europe and the Mediterranean), which he ran with notorious cocaine-trafficker Meinrad Calleja, who was later imprisoned for 15 years for just one of his crimes. I remember former Labour candidate and MP Dennis Sammut and former Prime Minister Karmenu Mifsud Bonnici spending thousands of Maltese liri on Libyan-sponsored conferences for hundreds of foreign guests at the Jerma Palace Hotel, in the name of a filo-Libyan organisation named Popem. Where did all the money come from? But Dennis Sammut hadn’t repaid the bank loan he had given himself, and post 1987 he and his political bosses were no longer in control of the Bank of Valletta. So with the looming threat of foreclosure, he fled from Malta, leaving the loan unpaid and probably eventually written off unless the bank seized his house instead, and a cartload of angry creditors waving their unpaid bills. He disappeared into the bowels of some large regional town (I couldn’t resist the reference to Toni Abela, one of Sammut’s colleages from the Golden Years of Labour) in England. “He’s living off some man there and the last I heard he was reading for some degree,” somebody said to me when I once idly enquired as to what had become of him, many years ago and long before the internet. And now he’s all over the internet, having well and truly buried his hideous past and probably hoping it won’t come back to bite him in the backside. And in case you’re wondering whether it can really be the same man, I have to break it to you: yes, it is. This is why we should be eternally grateful for the internet and how it has changed the world. Had there been internet in the years 1982 to 1990 or thereabouts, Dennis Sammut would not have been able to pretend to be somebody else and fake his way through the international organisations pretending to be a pillar of society without A Past. He would have been like Toni Abela, damned by Google from the word Go.